For those of you who have followed this column for a bit, you'll know that we're big fans of composting toilets for vessels. After years of dealing with smelly, wanky, miserable to service blackwater heads, the simplicity of a composting head--even a simple bucket composter--is a joy. They have very little to go wrong, and they NEVER stink. 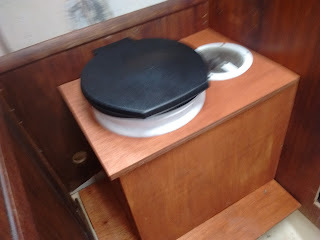 So imagine my surprise when, just a few days ago, my wife and shipmate goes "wow, the toilet stinks". And so it did. Why? I looked inside. Source of the stank was pretty apparent: urine was pooled in the toilet. Liquids=anaerobic bacterial action=stank. I tossed in some more biomass, in this case some rather disintegrated wood stove pellets, and forgot about it. And yet the stink persisted. I kept adding more stuff. What was going on? This is EXACTLY the same setup we'd been using for near four years now. It never smelled before, not ever. What the hell, man? So, being a good American, I turned immediately to them interwebs. At first, nothing. Then on a forum for one of the self contained composting heads, one of the commercial ones, I ran across a statement to the effect that "the finely ground peat moss sold in some garden centers is far less effective than wood chips or coarser biomass." Finely ground.. . . .hmm. 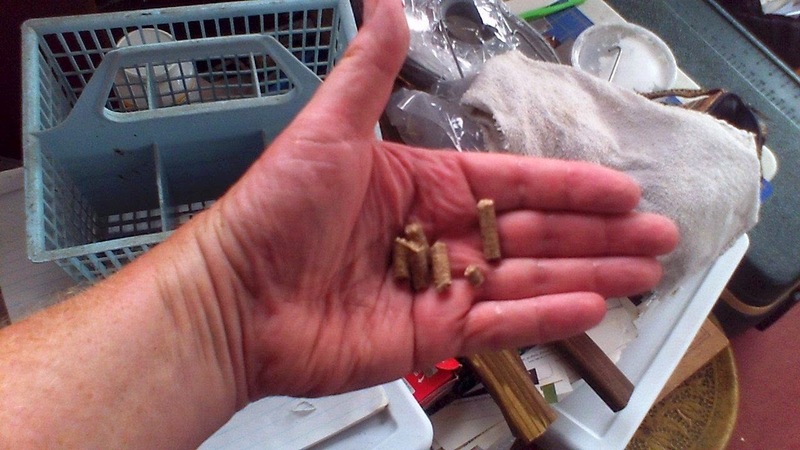 I looked at our woodstove pellets, the stuff we'd been using for years as biomass. The last two bags I'd gotten--the last two available at the end of the wood stove season--had been sold to me for, well, nothing, because they had gotten damp. As a result, what I had was essentially two big bags of very, VERY fine sawdust as the pellets had disintegrated. If you're using wood stove pellets, they should look like this, not like powder. So we trucked off to the garden center at one of the big box stores and came back with a 3 cubic foot block of compressed sphagnum moss peat, broke some of it off, and tossed it in. Bingo. Urine absorbed instantly, smell completely gone. This is a very good thing as the head in the new boat is RIGHT next to OUR heads as we sleep. So, what have we learned today, kids? We've learned that liquid is not your friend in composting toilet land, and that bulky and absorbent is waaaaay better than fine and powdery. The object is to create the circumstances for aerobic decomposition, the stuff that happens on a forest floor, and avoiding the cirumstances for ANaerobic decomposition, the stuff that happens in a septic tank. This means locking up the liquids and providing a way for air to circulate in and among the waste and biomass. WOW am i glad that worked. More really cool stuff over at Life, Art, Water, check it out. I, for one, really appreciate the information provided here. Hopefully it'll be added to the Googles and others can benefit from your experimentation.